Looks like Tim has answered your question and thrown in a tasty morsel. I had assumed that you could only use CFast 2 or SSD with the SSD plugged in via the SDI. Tim it appears has just said, the ‘Use Two Cards to Record’ option will achieve uncompressed raw 4.6K 60 fps. Alternate frames will be written to the SSD and the single CFast 2 card. If you have no CFast 2 card in Slot 1, then you can get to 60 fps if you record in raw 3:1 on the SSD. Yes the SSD Recorder is able to spill record across onto CFast or SD card when the SSD fills up. You are also able to do dual card mode with a CFast card or SD card in slot 1. Of course if you are shooting 4.6K Lossless RAW you should do this with one of the CFast cards on our supported for RAW list. I have an old SanDisk Extreme card I use in my original BMCC. Will this work in the UMP SSDR? I mostly plan to do 2K ProRes in 24p and maybe some undercranking, but it’d be nice to also do 3:1 or 4:1 compressed raw sometimes. Yes it should Jason. We are in the process of certifying a bunch of the older SSD's at the moment. Newer ones on the list will obviously have higher data rates possible and some of them are much more robust but yes the older SSD's should work as well as long as you are happy to work within the limitations of the data rate that the SSD you have can manage. There is also a nice little pressure plate in the SSD Recorder's slot design so that it holds the SSD firmly no matter what width of SSD you are using. Nice! I was wondering about the grip on the SSD, actually. Thanks, Tim! Just received my ssd recorder. Disappointed that I have to give up the weather seal around the power connection to use the recorder. Why a rubber seal only one the v mount plate and not on the ssd recorder? Also some even basic assembly instructions would be nice! Assembly instructions are in the manual which you get as a PDF when you install the Camera 4.5 Update. Interesting alternative for dual record mode and keep your SDI in and outs. Great solution for studio work. Now if they could improve on the design and have a ribbon based break out cable to allow for a neater build. The cables sticking out are not cool. CheesyCam needs to correct their error on the major con of the BMD solution. He states that you can’t do dual card recurring with the BMSSD solution. But you can do dual card if you have a CFast2 card in slot 1 as the BMSSD occupies slot 2. The CCTech solution does look good if you can manage shooting with the monitor door open or ajar. Might be awkward when you are shooting while your eye is glued to the BMVF as I like to do. Yes there are numerous fairly large factual errors in the video. Yeah, I don’t know about that. To put it simply, BMD’s solution looks like the safest...and I mean that in pretty much every possible way. Depending on how the SSD module is setup internally, it should be able to record ProRes at least from the UM cameras. The issue is getting firmware to allow the camera to talk to the SSD to set its recording format, i.e. ProRes or mirror the camera settings? Anyone else with an ssd recorder can confirm if it’s normal for the UMP screen to go black for 2-3 seconds when you switch from raw to prores? Sounds like the camera has to reboot when changing, which is why the screen is going black. You are correct. 2-3 seconds of black when switching from CFAST to BMSSD drive. I’ve used my bmssd drive for over a week now. On thing that’s bothers me too is the the SSD drive is still drawing power when the camera power switch is in the off position. The status light stays on as long as a battery is on the camera. Of course it won’t, since the SSD Module is sandwiched between the camera body and battery (pre-power switch in the circuit) and the SSD Module does not have its own battery, it will be drawing some power when the camera is shut down, but not very much I would think, kind of like the ENG camera “standby” status. The only way to power it completely down is to remove the battery (power source). The SSD module is passing power front he battery to the camera, so the camera power switch will not change the power status on the SSD. So I have the SSD recorder on my UMP and it works great (60fps in 4,6k full RAW on the Samsung 850 Pro). Now, I also bought an Atomos Shogun Flame, one of the reason being that I want to always have a back-up if the SSD would ever be faulty (I had a bad experience with an SD card that broke and losing all data for a client...). Now, I'm trying to connect my Shogun to the SSD recorder, but it doesn't seem to be working. Is it just me that is too stupid or is there no way to make it work?!? AFAIK that won't work, because the SSD recorder uses the SDI out for communication with the camera and is not a LOOP THROUGH output. It might work the other way round - going from camera out to Shogun Flame and from there to SSD recorder, but I don't know if the Shogun Flame would interfere with the special way how data is sent to the SSD recorder over SDI. André Normandin wrote: Now, I'm trying to connect my Shogun to the SSD recorder, but it doesn't seem to be working. Is it just me that is too stupid or is there no way to make it work?!? This won't work. When the SSD recorder is attached, the main SDI output sends a special data format that only the SSD recorder understands. It is NOT standard SDI video, therefore the Shogun will not understand it (nor any other SDI video device). 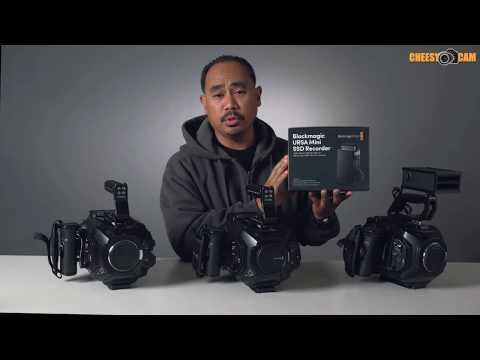 Blackmagic URSA Mini Manual wrote: It’s worth noting that because the recorder uses these SDI inputs and outputs, you can’t simultaneously connect your camera to an ATEM switcher. This also affects more than just an ATEM switcher. Your only option for the Shogun is to use the HD-only front SDI (viewfinder connection) with clean output. Why would they do that?!? André Normandin wrote: Why would they do that?!? Because it records on a "raw" format which is not supported on SDI. That is why they made a DATA link mode for offloading data in a 10/12gigabits per second style to the SSD unit. So once you attach the SSD unit you lose your capability to have back sdi outputs..
Because a 1Tb SSD is cheaper then a 256Gb CFast card and because I already own the SSD Recorder. From the moment it hit the market it was known that it was a DATA connection and you would lose the SDI capablility.. I have the feeling more and more people just buy the products without reading what it is and what it does or does not..
About 3 or 4 times a week somebody new comes up in the forum with "my USB3 intensity unit does not work on my laptop" Again somebody that did not read the minium required specs..
Or all those people that buy ultrastudio mini hardware. And the moment they put there camera to it, They find out they have no image.. Most common problem is that almost all cameras output 1080P while the Ultrastudio minis only support up to 1080i..
Xtreemtec wrote: ..Or all those people that buy ultrastudio mini hardware. And the moment they put there camera to it, They find out they have no image.. Most common problem is that almost all cameras output 1080P while the Ultrastudio minis only support up to 1080i.. While it does support 1080i, it also supports 1080p up to 30 as well. You can see all supported formats on the tech spec pages. Yes you are right Tony. It does support 1080P30.. But a lot of people think that if it has a HDMI port it will support HDMI 1080P50/60. Also most HDMI cameras or sources these days output 1080P50/60... And so a lot of people come to the forum after they boughed the unit and then find that it does not work..
And for a lot of people the only option then is to or Return the product, Sell it on with a dropped price.. or buy a scaling converter that will allow to drop down to interlaced or 720P..
That because they never checked if the resolution of there device does match the specs of the hardware..
Amen, my brother! Right on, and excellent advise. When building a system from different components, you need to make sure that all the bits will “talk” with each other. Connecting older interlace output only cameras to the newer progressive input AYEM/recorders, or new 1080p50/60 cameras to a device that only supports 1080p30 seems to happen way to often here. This might have been answered already, but is there news on the SSD recorder's compatibility with the Ursa Mini 4K? Guys, I understand what you are saying, but at the same time, the Ursa Mini Pro is their flagship. They sell the 4K video assist (which is pretty much the same thing as the Atomos Shogun), but they didn't figure that people would want to record a safety in 4k? Now I understand that there are limits to what they could do and they were already late with the release of the SSD recorder, I just hope they'll find a fix for it. There are a lot of reasons. If we made the SSD Recorder a standard video recorder then you wouldn't be able to record 4.6K to it in ProRes or in RAW... you would be able to record Ultra HD or 4K DCI as a maximum in sync speed. You wouldn't be able to record off-speed. There are lots of reasons. Doing it this way also means that despite the fact the camera needs an initial update to make the SSD recorder work with it... the SSD recorder doesn't need subsequent updates to be able to record other formats to it so if we decide to add another codec or format to the camera, that immediately works with the SSD Recorder without an update. If you want to record an Ultra HD safety to an external device you can already do this with the Video Assist 4k. Ruben de Boer wrote: This might have been answered already, but is there news on the SSD recorder's compatibility with the Ursa Mini 4K? Not yet.. They are still trying to get the firmware to work for the ursa mini series. At this moment only the Ursa Mini Pro works with this SSD unit. Xtreemtec wrote: Not yet.. They are still trying to get the firmware to work for the ursa mini series. At this moment only the Ursa Mini Pro works with this SSD unit. "They are still trying to get the firework for the Ursa Mini series..."
Tim Schumann wrote: If you want to record an Ultra HD safety to an external device you can already do this with the Video Assist 4k. I think what André meant was, if one is using the SSD module, one cannot also record to another external device (for safety/backup) in 4K at the same time. Tim, do you have any updates about its compatibility with the Ursa Mini 4.6K? Thanks! I believe this is the update some of you were looking for? I accept a christmas gift like this every day!! BTW Tony that was you 2999th Post..
Added support for URSA Mini SSD Recorder on URSA Mini 4.6K. Lowers SDI output latency to less than 1 frame for live production. Added ability to switch between shutter speed and angle. Added scrubbing support for playback in camera. Added autofill option for lens manufacturers in metadata slate. Improved keyboard for metadata slate. Improved support for B4 lenses. Fixed focus control on Canon EF-S 18-135mm f/3.5-5.6 STM and USM lenses. Fixed iris control on Canon EF-S 17-55mm f/2.8 IS USM zoom lens. Fixed bug where lens change was not recognised in metadata if powered off. Fixed zoom control bug on Canon 18-80mm T4.4. Added overlays support for URSA Mini SSD Recorder. Improved film to video functionality. Fixed bug where f-stop would show incorrectly when manual lens is mounted. Cheers to the team, they made my day! THANKS TONY ! ! ! ! ! ! ! For those with an URSA Mini 4K please rest assured we will try to get these new URSA Mini features to you as well as soon as we can. Yay UM4K! I wait with annnntttttiiiicccipation. All thanks to Tim and the rest of the team for their hard work to get this together for all of you as a holiday gift before the New Year! Cheers to them! Tony you’re part of the greater team. So thanks to you as well as everyone that made this happen, thank you guys for listening and continuing to push the envelope. Finished a two day shoot Dec 20-21 on firmware 4.4 but will upgrade to 4.8 now. Thanks to the team for getting this highly anticipated update out for the URSA Mini 4.6K! Tim Schumann wrote: For those with an URSA Mini 4K please rest assured we will try to get these new URSA Mini features to you as well as soon as we can. 1 question That might be easily answered?? How much does the motherboard of the 4K and 4.6K differ from each other? With other words how high would the proability be that the UM4k will also be less then 1 frame latency on it's 12G output? At the point of buying a half year old UM4k video set with 4 cameras. But the latency is holding me back. I hope and guess that it is the same motherboard and will handle it fine.. Just the readout from the sensor is different on the 4,6K to accomodate for the extra pixels.. But on the other hand might be a completely different camera on the inside.. So i was wondering if the latency issue can be fixed on the UM4K too? We are confident we can get the latency down on the 4K Mini as well but this is why we couldn't release the Mini 4K update at the same time as there is some extra work to do with the different sensor and main board on the Mini 4K. Thanks Tim for this info.. Very valueable to me! Just installed the ssd recorder on the mini, nice and simple only took about 10 minutes with no tech sweat! Works great and is well built- well done Tim & team. It’s so nice to look at the monitor and see I can shoot for hours!